Virginia and the eastern side of the North American continent are in the middle of a tectonic plate. 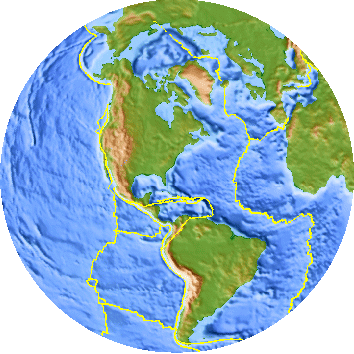 The North American Plate is one of the 15 or so major "chunks" of crust that float on top of the hot mantle. The plate includes both continental crust and heavier (iron- and magnesium-rich) oceanic crust. Virginia is located far from the edge of the North American Plate. In contrast, California/Oregon/Washington are at the edge of the North American Plate. In Southern California, the western edge of the North American Plate rubs against the eastern edge of the Pacific Plate. That boundary is marked by the San Andreas Fault and many other named/unnamed faults. The North American and Pacific plates are moving in different directions, and the rocks bend under the strain - up to a point. Earthquakes occur when the pressure to move exceeds the capacity of the rocks to resist motion. Intermittently, the North American/Pacific plates break free of each other, and the edges spring into a new alignment. As the land moves into the new alignment, everything shakes nearby in the earthquake - and buildings, highway bridges, etc. may collapse. Virginia is located near the center of the North American plate and, thus, experiences a much lower rate of seismicity than California. Another difference is that California earthquakes often break the ground surface, while earthquakes in Virginia usually occur on faults at depths of from 3 to 15 miles. 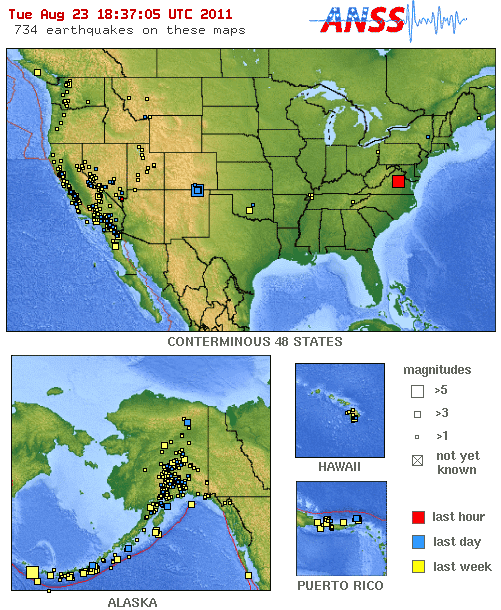 Thus, the earthquakes felt in the Commonwealth today generally have no relationship with faults seen at the surface. 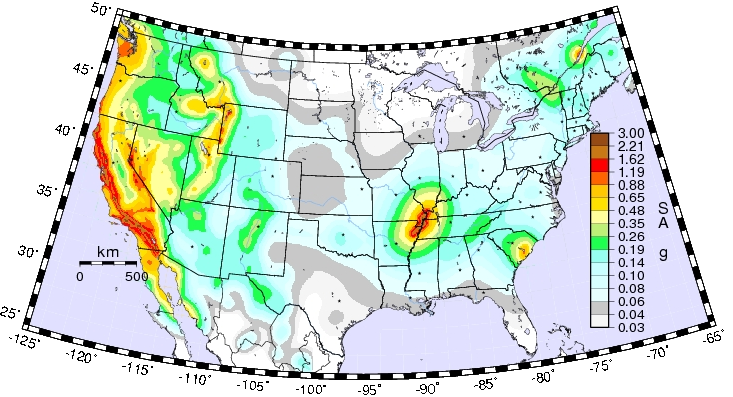 The United States east of the Mississippi has many fewer earthquakes than does the west, and western quakes are stronger. However, the less-intense eastern earthquakes can cause damage further away from their origin. In the east the underlying bedrock is pretty well-connected (like a concrete slab). Waves from eastern earthquakes can travel farther that in the west, where the underlying topography is so chopped-up (like a brick patio) that the energy of a quake is dissipated closer to the epicenter. Earthquakes in Virginia are rare in the Coastal Plain, but are not restricted to just one region. 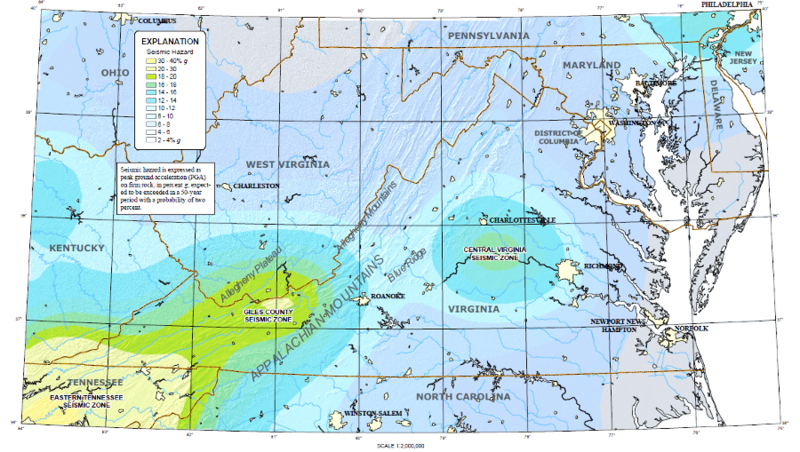 Two zones in Virginia are more susceptible to earthquakes than others, and can be identified by the rivers which follow those faults. The James River follows the Central Virginia Seismic Zone between Charlottesville and Richmond, while the New River follows the Giles County Seismic Zone from Radford to the West Virginia border. 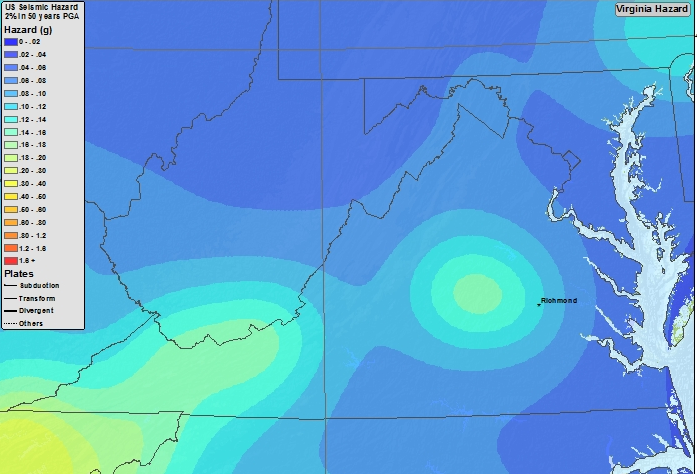 Virginia is pretty stable, but just about any place in the state can experience an earthquake. Manassas was surprised by a 2.5 magnitude tremor in 1997, and an equivalent earthquake was felt in Culpeper two months earlier. 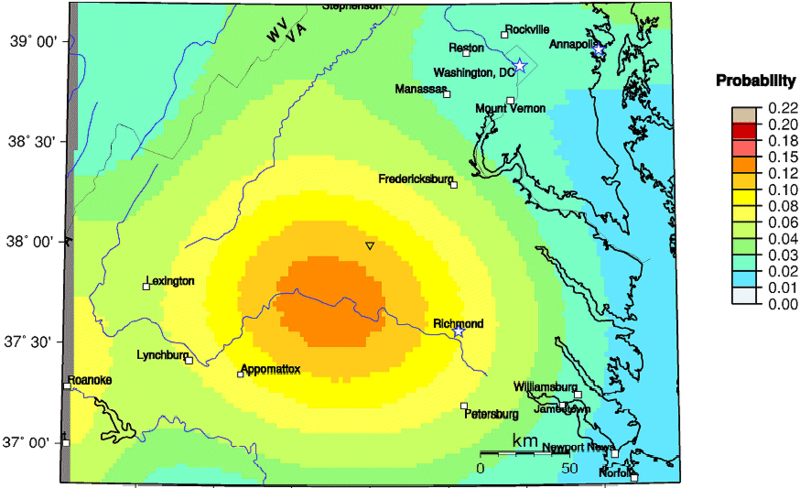 Near the southern edge of the Culpeper Triassic basin, a magnitude 3.2 earthquake rattled Charlottesville in 2001. 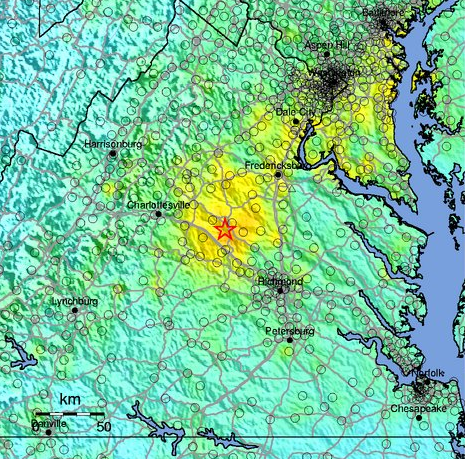 The 1997 earthquake in Manassas was a tiny 2.5 magnitude tremor, but was clearly felt in the Northern Virginia area. One local person's description was drawn from James Bond novels, with a report of being "shaken, not stirred" after hearing what sounded like an unusually large sonic boom. She checked to see if a tree had fallen on the roof, before realizing she had felt an earthquake. Another resident, whose house was above the epicenter, was awoken from a deep sleep. For years she had avoided traveling to California from a fear of earthquakes, but had returned the previous day from San Francisco. 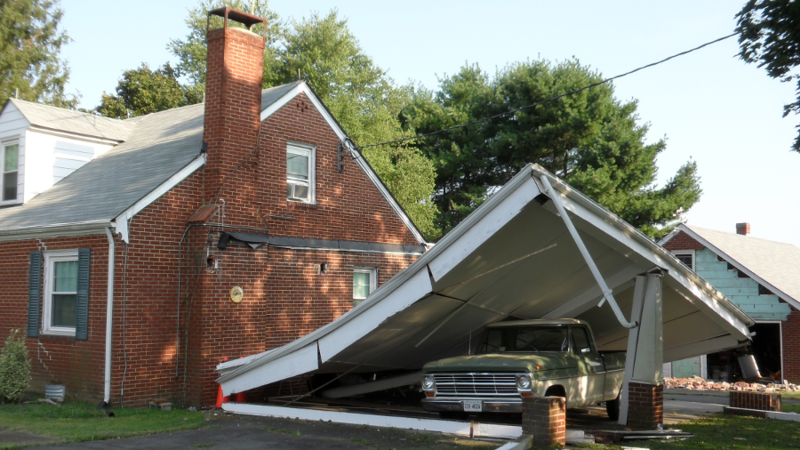 She did experienced an earthquake, but it occurred while napping in her own bed in Manassas. ...befuddled residents wandered outside their dwellings and workplaces and flooded emergency dispatchers with telephone calls asking what had happened. Fire and rescue officials rushed around in a vain attempt to find an explosion to explain the event, checking with everyone holding blasting permits in Prince William County. 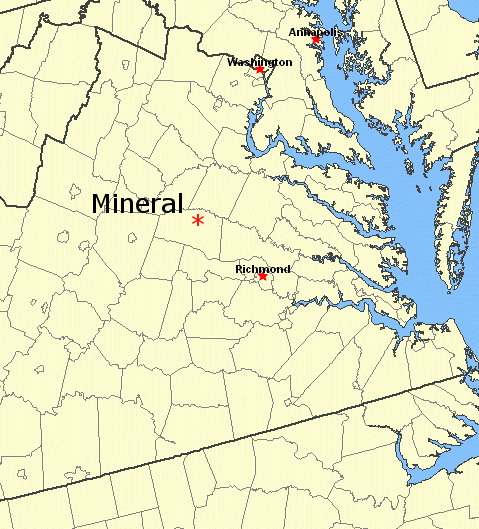 The most recent large earthquake in Virginia occurred on August 23, 2011, when a magnitude 5.8 quake was centered near Mineral, Virginia (followed by a 4.5 aftershock) in the Central Virginia Seismic Zone. 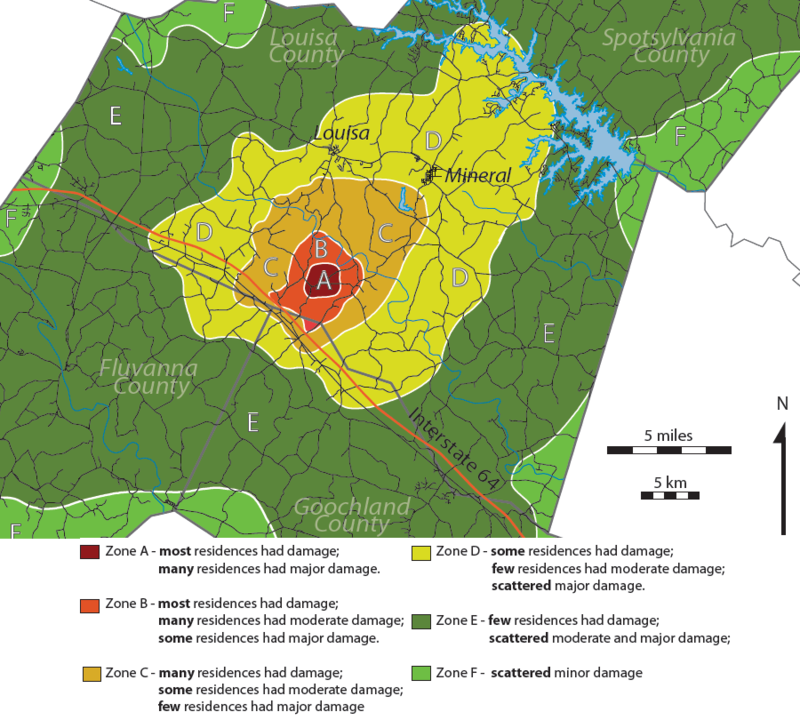 In 2003, a 4.5 magnitude quake had struck nearby in Goochland County. 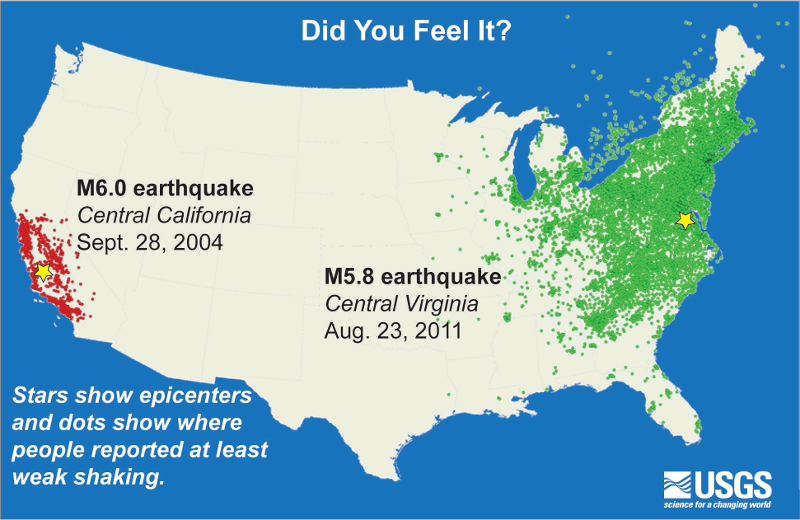 In the August 23, 2011 earthquake, rumbling/shaking lasted 10-15 seconds and triggered buildings to be evacuated between New York City to Richmond. 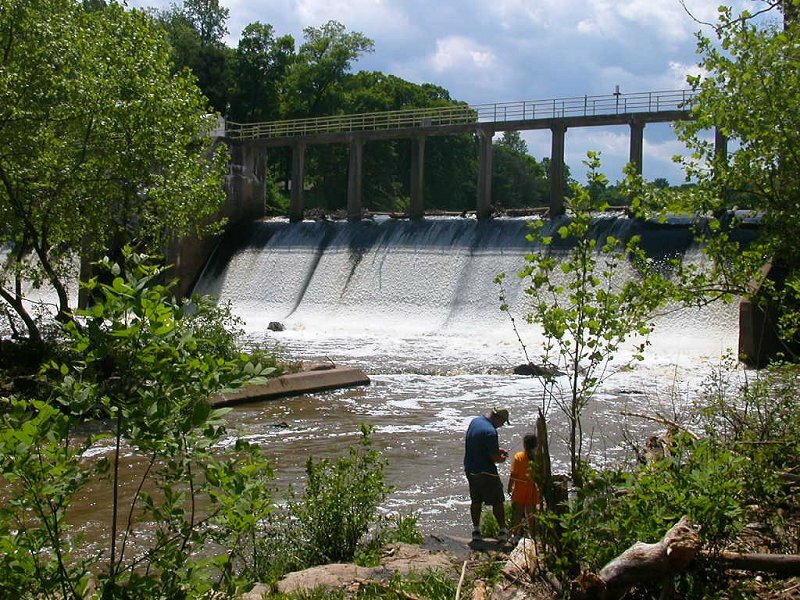 Modern technology is fragile, and the two nuclear power plants 11 miles away at Lake Anna shut down automatically. Buildings on the Fairfax campus of George Mason University were closed, urban workers in Washington DC took the rest of the afternoon off, and a classic traffic jam developed on Northern Virginia highways. Gargoyles fell from the National Cathedral in Georgetown. The Washington Monument cracked, closing it for several years and requiring a $15 million repair project. In 2016, park rangers were still trying to repair the elevator. 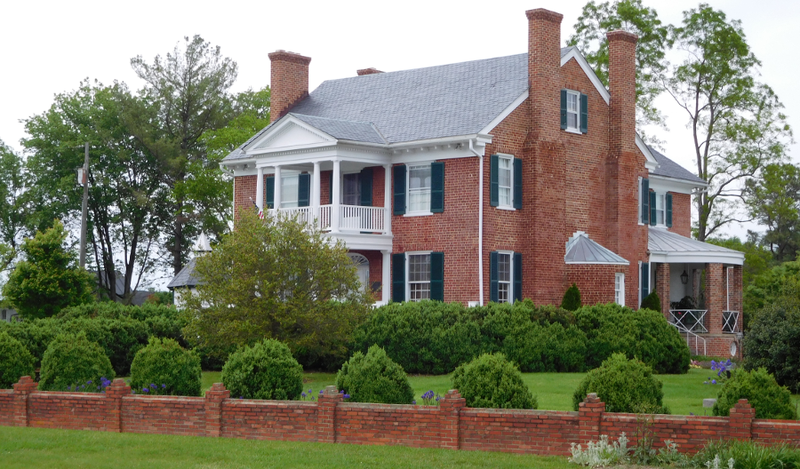 In Culpeper County, the chimneys at the historic Salubria house cracked. The Levy Building in the town of Culpeper, built in the 1800's, was damaged so severely that it was demolished and replaced by a small park. 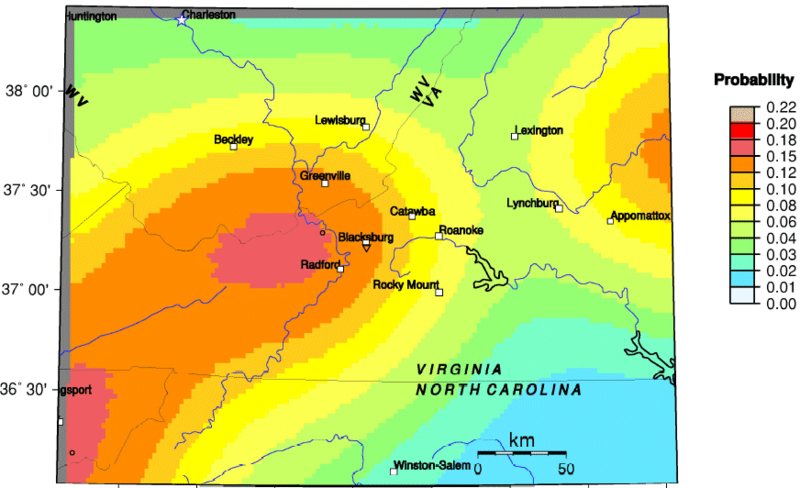 The 2011 Mineral quake appeared to be associated with the Spotsylvania high-strain zone, the boundary between the Goochland and Chopawamsic terranes. Those terranes are chunks of continental crust that were squeezed onto the North American continent as the Iapetus Ocean closed during the Paleozoic era. The edges of different terranes are zones of weakness, and potential sites of future earthquakes that relieve stresses that build up within the bedrock of Virginia as the North American Plate drifts westward. 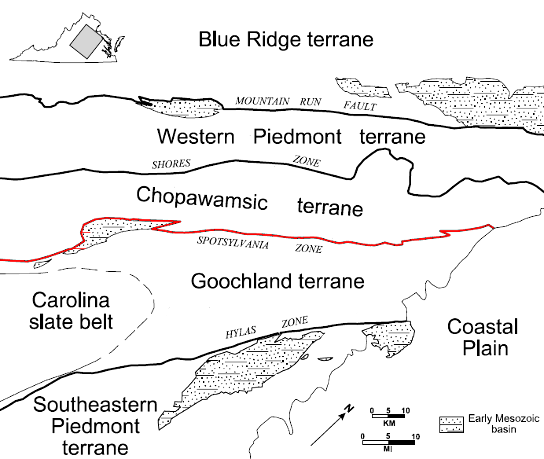 The Chopawamsic Terrane was a volcanic island arc that formed in the Ordivician period. Before the island arc was scrunched into Virginia, it was similar to Japan or the Aleutian Islands today. During the Taconic orogeny, as the Iapetus Ocean closed, the Chopawamsic Terrane was pushed by tectonic motion and plastered onto the edge of an expanding continent. 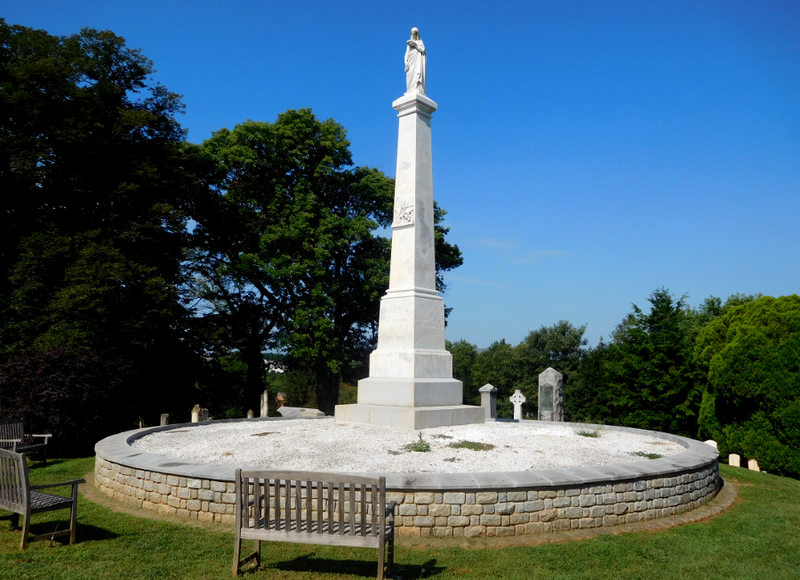 The other "big one" in Virginia (about a 5.8-6.0 on the Richter scale) was on May 31, 1897, in Pearisburg, the county seat of Giles County. The judge in the courthouse adjourned a trial, jumped over the railing, and fled outside with everyone else as the courthouse rattled, brick walls cracked, and chimneys fell over.7 It was one of Virginia's most powerful recorded earthquakes - but our recorded memory extends back only a few centuries, while the geologic history of the state extends back hundreds of millions of years. In 1959, Giles County was shaken again by a 3.8 temblor, and windows were broken in the 1975 Veterans Day earthquake in Blacksburg. 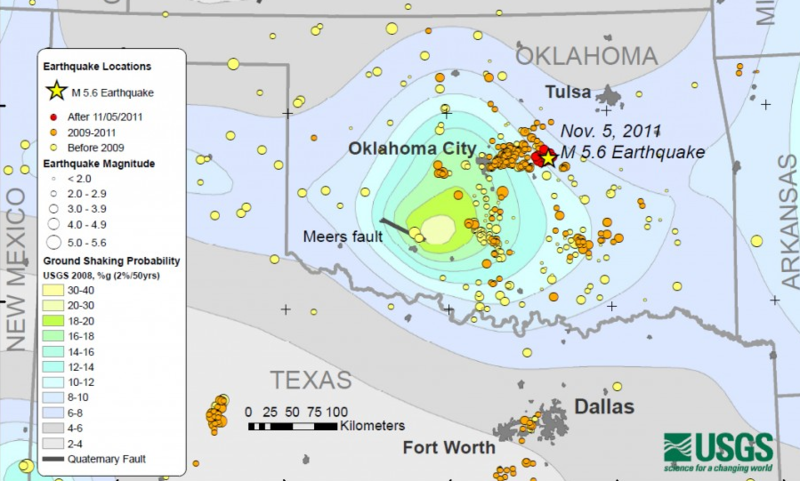 Oklahoma is experiencing a swarm of mild earthquakes triggered by drilling for oil/natural gas and/or by deep injection of fluids left over after oil/gas well development. In Virginia, the story is different. There has not been a sudden increase in the number of earthquakes in Virginia due to drilling, because there has not been a major increase in drilling. Virginia has only a handful of oil wells, and most natural gas wells produce methane from layers of coal too deep to mine economically. There is potential for fracturing ("fracking") sedimentary layers in the Taylorsvile Basin northwest of Fredericksburg, but commercial development of hydrocarbon resources by fracking has not occurred there yet. Nonetheless, the number of earthquakes in Virginia is "increasing" - because geologists are getting better at recording earth tremors. New sensors have been installed to identify the smaller quakes. Homeowner insurance policies typically exclude coverage for an earthquake. When a house in Virginia is damaged by an earthquake, homeowners must pay for repairs out of their own pocket - unless the President declares a Federal disaster. After the 2011 quake, the Federal Emergency Management Agency (FEMA) recommended against Federal disaster relief, using the Preliminary Damage Assessment to determine that local/state governments could absorb the costs of recovery. However, Governor McDonnell appealed the FEMA recommendation.